Daniel Goguen is a traditional Counry singer/songwriter from Cocagne, New Brunswick. He mainly sings in French, but he also recorded a few English songs. He has been performing for more than 25 years. 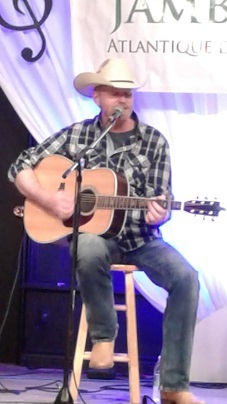 He recorded his fourth CD in 2015 entitled Les Backroads. The song, Les Backroads from the CD was selected song of the Year on the Acadian CountryRadio music charts. Another song from the CD entitled Finalement la fin de semaine was selectedsong of the year in 2015. In summer of 2016, Daniel won the Stingray Traditional Country Music Prize at the St-Tite Western Festival in Quebec with his song Finalement la fin de semaine. In 2016 Daniel was nominated for Album of The Year for Les Backroads and also Male Singerof the Year at the French Country Music Gala held at the Montreal Casino. Daniel has been on two TV shows of Pour l'Amour du Country. Daniel's style of music is hard-core Traditional-Country and his musical influence is Merle Haggard. On his Les Backroads CD, there is 3 original English songs: I Can't Argue With My Heart, MissYou Just The Same and Real Country. Daniel performed in PEI on August 5 at The Mont-Carmel Parish Hall Summer Concert Series 2018.He opened the show and was an instant hit. He sang mostly in French but also sang some songs in English before a full house and received 2 standing ovations. Daniel keeps busy with his music and performs is many venues and Festivals in New Brunswick and Quebec. Some performing dates are posted on this website as well as Daniels web site. For more information regarding Daniel Goguen and his music and bookings, refer to his websiteaddress posted above.